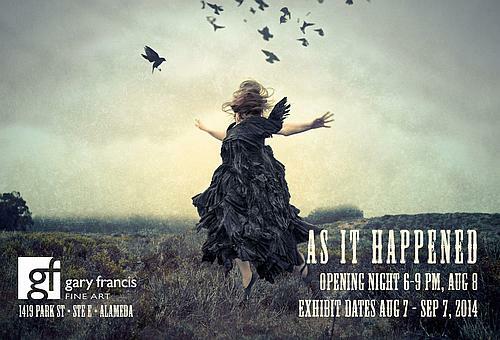 I’m excited to be showing in Alameda for the first time, with a group of other Bay Area photographers, in “As It Happened” at Gary Francis Fine Art Gallery in Alameda. The show runs August 7 through September 7, 2014. I hope to see you at the gallery, at 1419e Park Street, for the opening reception on August 8. “This group exhibition of Bay Area photographers investigates themes that explore basic and complex images of mundane objects, inner feeling states and personal dialogs with self, the unique forms and shapes created by the interplay between natural elements and man-made structures, and everyday scenes and distinctive portraits of life in the Bay Area. The fine art photographers throw the spotlight on our daily experiences that are often omnipresent, necessary, and overlooked. Through their ongoing exploration, surprising and creative images are made conscious, allowing the artist and viewer to be more connected to the richness of life, experience, and surroundings.